SIP (Session Initiation Protocol) trunking allows enterprises to communicate over IP to locations outside the enterprise, including the PSTN. 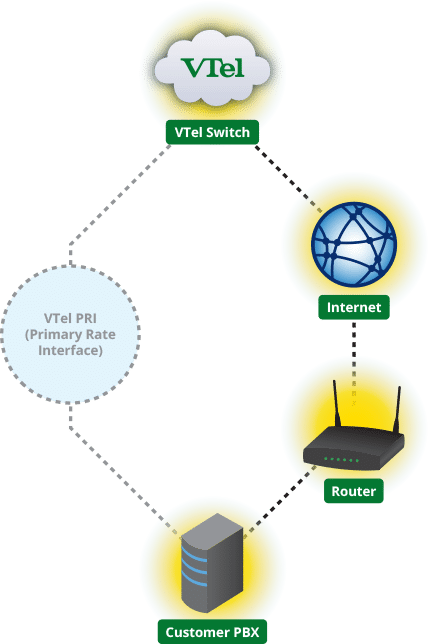 Whereas traditionally there was a PRI (Primary Rate Interface) connection with limited channels between the PSTN and the enterprise, SIP Trunking pulls the connection from the PRI to the WAN. Value and Scalability – Instead of working with the PRI’s limited channels and having to add more circuits if additional capacity is needed, you can simply increase your bandwidth, which is less expensive. Reliability – Sip Trunking has built-in disaster recovery with “direct trunk overflow,” which spills calls from one location to another if necessary. For example, if you lose service with the LAN, you can redirect your calls through your internet connection. Leave border control to VTel – The responsibility to change IP to TDM is moved from the enterprise to us as the provider, so we handle the session border control for you. Sign Up! Request a quote for a SIP Trunking solution custom-fitted to your business.